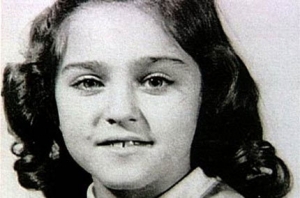 #5 - Can you Name These Celebrities By Their Childhood Pictures? Quiz #5 – Can you Name These Celebrities By Their Childhood Pictures? This artist is included in the Guinness Book of World Records and she has sold over 200 million records. She dated Vanilla Ice for the better part of a year, during which she would reportedly call him in the middle of the night demanding to know if he was with another girl. Do you know who she is?